Finally, the aspect of the art that separates the “Derivative Traditional” from “Main-line Modern” etc., is the presence of the (B) Kata (eg: learning via the essentially non-marital prototype, and then gaining an understanding of applications). Click here for more information on the (B) Kata. Chikamasa’s martial art known as “Oshikiuchi”was a set of martial arts techniques specialized for use by Samurai in formal situations where the wearing of weapons is restricted, such as the palace of one's lord. If true, Saigo Chikamasa was most likely one of the last Samurai class members. 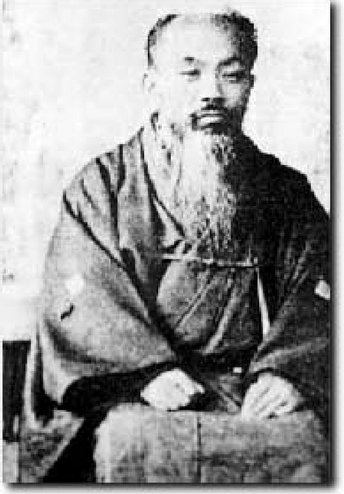 Takeda Sōkaku, the modern founder of Daitō-ryū Aiki-jūjutsu, claimed that it was Saigo’s secret martial art passed down through members of his family in the Aizu domain, and that he combined in some way with his family's martial arts, which he eventually taught publicly as Daitō-ryū. Takeda Sōkaku’s assistant, Kōtarō Yoshida was Shodo Morita’s Daitō-ryū instructor. An interesting secondary footnote is that it was also Kōtarō Yoshida who introduced Ueshiba Morihei, to Takeda Sōkaku.